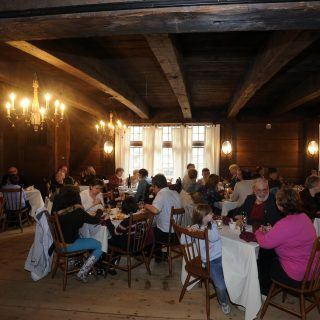 Cost: Non-Member Adult $70; Non-Member Child (4-12) $38; Member Adults $53 ; Member Child (4-12) $26; The Easter Feast Experience at Bullard Tavern includes admission into the village (for non-members), the Easter Feast, costumed interpreters, as well as all tax & gratuities. Season Pass holders may take advantage of the member price since their admission to the Village is covered. Step into the charming historical ambiance of the Bullard Tavern Great Room and enjoy a delicious Easter feast with your friends and family. While you enjoy your food, watch costumed interpreters prepare soup over the hearth and listen to occasional musical performances. Village admission (or a membership or a season pass) is required to get to the Bullard Tavern. Discounted admission is available for non-members attending this feast. You may also be interested in a scrumptious buffet brunch at the Oliver Wight Tavern.